Join the discussion on our forums! Come discuss Wrenchcalibur over in our dedicated Wrenchcalibur discussion topic. 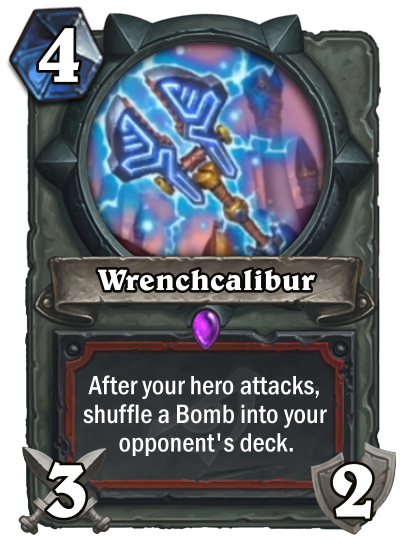 After your hero attacks, shuffle a Bomb into your opponent's deck. Whoso pulleth out this wrench from the toolbox is rightwise king of the lab. Does this work with Augmented Elekk? This and Captain Greenskin the next turn. And Upgrade! later. Just don’t forget about your own face. Is it worth it without Upgrade though? That's still 16 damage if you go all in face, or 10 if you don't. Heck, even if oozed, it's still 8 damage face or 3 on something and 5 face. While needing a bit of luck so the enemy would draw it, I think it's well worth it even without upgrade. "While needing a bit of luck so the enemy would draw it", while I should've written 'them', I did specify that, yes. Doesn't mean you can't get lucky. They can never draw them or draw them all on the next turn, in a row. damm... I will have to use Upgrade!